The following is, I hope, a pretty brief F.A.Q for the elemental shaman. Perhaps you have recently reached the dizzy heights of level eighty and need a fast run down of the basic aspects of raiding and grouping with this class and spec. Maybe you’re primarily an enhancement or restoration shaman that has decided to dual spec. Do you have a newly acquired alt? 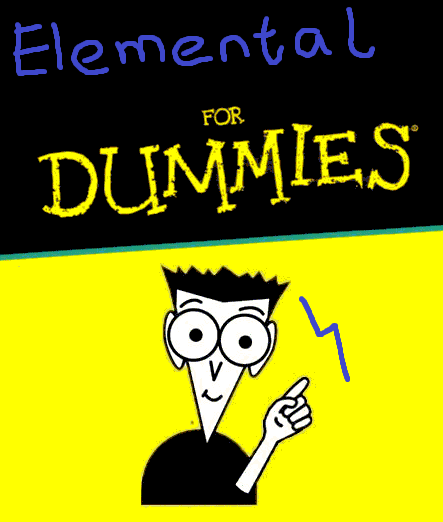 Whatever the reason, this guide will address the most common questions regarding the elemental spec. It will also contain links, where appropriate, to my more in depth articles on each topic. Finally, if you have a question, no matter how basic, feel free to post in the comments and I’ll be sure to get back to you. The above is pretty much the “cookie cutter” elemental spec. What Glyphs Should I Be Using? Using a spreadsheet such as Zap! will allow you to calculate which glyph is better for your own personal gear levels. Aside from this, different encounters can favour a different glyph. As a rule, consider the mechanics of the encounter, if there are multiple targets, then the amount of damage that comes from your Chain Lightning will increase. As such, using Glyph of Flametongue Weapon will be a better choice. On fights with a great deal of movement, Glyph of Lava will likely edge ahead because you’ll cast fewer spells in general but Lava Burst will remain your priority. Under these circumstances, your “filler” spells (Chain Lightning and Lightning Bolt) will suffer more. If you want to read more about the comparison between Glyph of Lava and Glyph of Flametongue Weapon, check out this article. 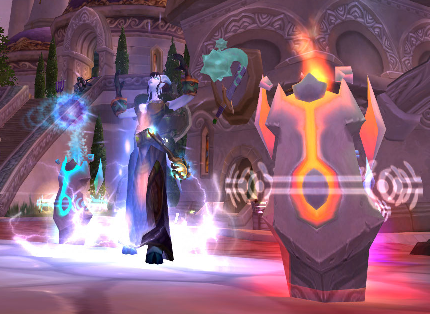 What is the DPS Rotation for an Elemental Shaman? Use Elemental Mastery whenever it is off cool down. This talent causes your next Lava Burst, Lightning Bolt or Chain Lightning to be an instant cast. It also gives 15% spell haste for the following 15 seconds. You can read more about utilising Elemental Mastery here. Chain Lightning can be a DPS increase assuming you have the mana pool to sustain it. At lower gear levels, you may find you run out of mana by trying to spam this. Whether Chain Lightning is an increase to your personal DPS or not depends on a couple of factors; the number of targets and your level of haste. For most people, the above effects will cause your Chain Lightning cast to be too fast and this will result in too much GCD waste. You can read my in depth guide to the use of Chain Lightning here. Ok. How Do I AoE as an Elemental Shaman? Primarily through the use of Chain Lightning. Focus on one target with your normal single target rotation and cast Chain Lightning whenever it is off cool down. In addition to this and as you get more confident, you can weave in the use of Fire Nova and Thunderstorm. Thunderstorm will return mana to you and damage nearby enemies within 10 yards. Due to this, you have to be in melee range to use this ability. Fire Nova will cause an AoE wave to erupt from your active fire totem. It’s best used in combination with your Magma Totem. Again, you have to move into melee range to place this totem and then use Fire Nova. Be aware if you’re using Thunderstorm in this way, you should probably glyph it to remove the knock back component. Your tanks won’t appreciate you knocking their nicely gathered packs in every direction. Help! Which Totems Should I Be Using? Fire – Totem of Wrath. If there is another elemental shaman placing Totem of Wrath, use Searing Totem. If there is a demonology speced warlock with Demonic Pact, use Searing Totem. Which Weapon Buff Should I Apply? Flametongue weapon. At it’s highest rank, it will increase your spell damage by 211. Which Flask Do I Use? Which Food Should I Use? Either a Fish Feast (46 spell power, 40 stamina) (if supplied) or Firecracker Salmon. At lower gear levels, you may find yourself struggling with mana, if so, consider stocking up on mana potions. If mana is no issue then your choice is between a Potion of Speed and the Potion of Wild Magic. Generally, a speed potion will provide the highest DPS to an elemental shaman. However, during periods of high haste (Heroism being the prime example), it is a higher DPS increase to use a Wild Magic Potion. If you’re pre-potting (that is to say, using a potion just before you enter combat, thus allowing you to use a second later on), then consider the fight and where you will be using cooldowns. If you’re going to be popping Heroism at the start, pre-pot with a Potion of Wild Magic and use a haste potion later in the fight. If you’re using Heroism later, pre-pot with a Potion of Speed and use a Wild Magic Potion during your Heroism cast. Heroism can then be timed for when potions are coming off cooldown. If you pre-pot with haste, hold off using Elemental Mastery until your potion is expiring. You can pop Elemental Mastery a couple of seconds before the potion expires and refresh your Flame Shock. This is known as double-hasting your Flame Shock. For more information about stacking cooldowns and potions, read this article. When Do I Cast Heroism? Rotface – At the start on both normal and heroic modes. Festergut – At the start on both normal and heroic modes. Professor Putricide – At the beginning of phase 3 on both normal and heroic modes. Help, I’m on Interrupt Duty! How?! The spell that interrupts casting is Wind Shear. Shaman can interrupt once every 6 seconds (or a little longer, allowing for human reaction speed after the cool down is up). You can use a stop casting macro to interrupt. It’s imperative to make sure you can see enemy cast bars. I’d advise using an addon such as Quartz or ACB and enable both target cast bars and focus target cast bars. Addons such as Announce will announce in raid chat (or in any channel you specify) when you have successfully interrupted a cast. This can be useful when an interrupt rotation is needed. Be advised, the range on Wind Shear is only 25 yards, less than the range of our DPS spells. This means you need to stand closer to the target than usual to ensure you’re in range to interrupt. What is the Hit Cap for Elemental Shaman? If you play a Draenei, your Heroic Presence will provide another 1% hit rating. (Be aware, even having a Draenei in your party means you will benefit from this increase. Is it Bad if I’m Under Hit Cap? Simply put, yes it is. You should never neglect your hit rating. It doesn’t matter how hard your spells hit if a large percentage of them are resisted. Being slightly under cap or slightly over cap isn’t too much to worry about. If you’re only a few points under, the resists will be few enough to make the DPS loss quite negligible. Avoid being greatly over hit cap however as every point over is a waste. Remember you can always gem for additional hit rating. What Stats Should I Look For on Gear? Hit rating is always our priority. The strongest stat to influence our DPS is spell power. This dictates how hard our spells hit. The second strongest stat for us is haste. Simply put, haste makes us cast faster. The third stat for us is critical strike rating. Part of the reason this isn’t as desirable for us in comparison with some other casters is due to Lava Burst being a guaranteed critical strike if Flame Shock is on the target. That results in critical strike rating having zero influence over one of our primary offensive spells. Spirit is of NO use to elemental shaman. Be particularly aware of this if you roll on cloth items that are otherwise nicely itemised. Mp5 is of little use to us as we rarely struggle for mana regeneration. You may find this on some items that are otherwise decently itemised but in general, this is best left to the restoration shaman. You can read a more in depth guide to elemental stat priorities here. Is There a Best in Slot or Gear Guide Laying Around Here? Naturally! You can find it here. In addition to the best in slot gear guide, you can also find a guide to the best available bind on equip items (that is to say, those you can pillage from the auction house), here. All red sockets should be Runed Cardinal Rubies. If the socket bonus is good and requires a yellow gem, then use a Reckless Ametrine. (By “good” I mean a socket bonus with + spell power.) If the socket bonus is useless to us or highly undesirable (such as intellect or MP5), gem with Runed Cardinal Rubies. Our meta gem requires two blue gems, use Glowing Dreadstone. Haste – Don’t use pure haste gems. Spell power is still our strongest DPS influence. Critical Strike Rating – It’s our weakest offensive stat as it can’t influence Lava Burst. Spirit or Mp5 – Spirit is useless to any shaman and elemental players do not need Mp5. What Meta Gem Do I Use? Without doubt the Chaotic Skyflare Diamond. This requires two blue gems for activation. Read the above section on which gems to use. What Enchants Should I Get?